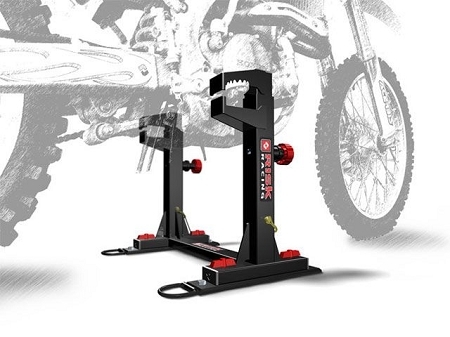 The Risk Racing Lock-N-Load Moto Transport System securely holds your motocross bike into your trailer without the use of tie-down straps, floor anchors or wheel chocks. 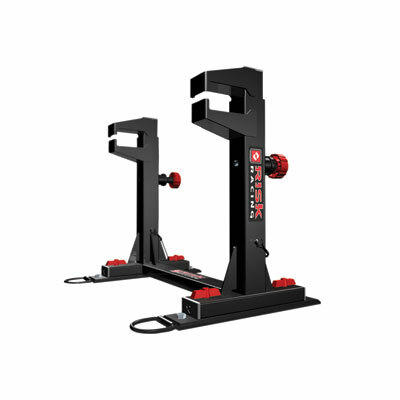 The Risk Racing Lock-N-Load Moto Transport System takes an enormous amount of pressure off of the fork seals during transit, and it frees up valuable space allowing the transport of more motorcycles or gear. Additionally, the Lock-N-Load Moto Transport System can quickly be removed from the trailer floor by unscrewing the 4 thumb screws leaving only the low profile mounting plates. Each plate has a "D" ring for additional anchor points on your trailer floor. To operate the Lock-N-Load: Rotate the knobs into the lock position and simply roll or ride your bike into the trailer until your foot pegs hit the open jaws of the Lock-N-Load. Then step on the upper jaws and they will automatically lock into place. To release your bike, simply rotate the knobs into the release position and step on the top jaws. This will automatically release the jaws and free your motorcycle. For additional safety, insert the attached locking pins prior to transport. You can replace the locking pins with pad locks for added security and a theft deterrent. Saves fork seals by drastically reducing fork seal pressures. Leave your bike in your trailer overnight. No more web of straps, wheel chocks or floor anchors. This is a much simpler and cleaner solution. Load more bikes and gear in your truck or trailer. Load bikes shroud to shroud, 4 bikes wide in a toy hauler. Quick release from trailer floor (only the low profile plates with the extra "D" ring remain on the floor). Extra trailer plates are available (sold separately). Truck bed adapter plates are available (sold separately). They span your corrugated truck bed for a secure mount. Rider Cargo Tie Down Extension Straps 12"